If you’re familiar with the Bodog brand that was previously targeted to the United States, and now Canada, you’ll be happy to know that Bodog is available to Asian sports betting markets as well. 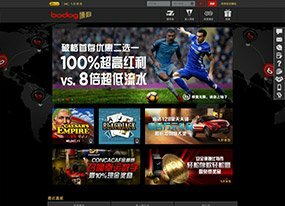 Available to a wide range of Asian countries, Bodog88 ties itself to a brand that has been a powerhouse in the sports betting industry for over a decade. Not only do they boast an exceptional sportsbook, they offer casino, poker and racebook options as well. Bodog88 is available in several languages, including English and two different Chinese dialects. Their customer service team speaks many different languages, via phone, e-mail, and even live chat. Their customer service team is available around the clock, and they usually respond in a timely manner. Some e-mails can take about a day for a response, but that doesn’t differ from many other sportsbooks these days. Signing up at Bodog88 is quite simple, you enter brief personal information including your name, address, e-mail, age, and you’re ready to make a deposit. Available currencies include USD, Chinese Yuan, Thai Baht, and Malaysian Ringgit. Bodog88 accepts Bank Wire Transfers, Astropay (Prepaid Cards), Online Debit, QQPay, Quickpay, WeChat and Bitcoin. Bonus options at Bodog88 are more plentiful than its North American counterparts. For first-time depositors, a 100% welcome bonus with a 14x rollover is available or if you want a faster rollover, they have a 50% bonus with an 8% rollover. They offer many other seasonal or special event bonuses that change over time – which are listed on their promotions page. If you play regularly, these bonuses are a great way to earn some extra cash to bet with. Bodog88 is a great option for both professional bettors and amateurs, as they accept minimum bets of $1, and maximum bets of $5,000. They offer plenty of popular sports to wager on from around the world, including all professional North American sports. If sports betting isn’t your thing, they have plenty of casino and poker options available. The Bodog88 mobile site has all of the same features of their desktop site. You are able to log in to your Bodog88 account from your smartphone and make a deposit, place a bet and even request a withdrawal. If you’re more interested in live betting or in-play betting, you can place wagers in real time for every play in your selected game or match.